Please know that this had to be written not just for myself, but to help others that have been spoken of as a good friend but yet, not treated as one. Thank the Lord for the Gift of Forgiveness and the Healing Power Forgiveness Posses! Thank Our Lord for planting and growing forgiveness in you and through you. 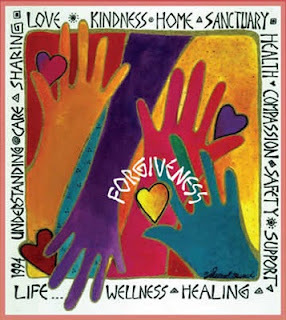 May we All Learn and Receive the Gift of Forgiveness, And then Using it in abundance as many times as necessary! Remember that, what every you allow to be planted in your heart and into your life, Will Grow! The Tree is known by it's Fruit. Please know that I was not hurt or angry by your offense, but that I COVER your offense toward me With UnconditioanLove and JOY In the Name of Jesus to Honor Him. And Yes, even when you told me what a Good friend I am to you, And that you have always thought of me as one. And How MUCH Love you Have for me. I believed you then, And I still do believe that you really want to feel this way for our friendship. Even though your actions do not equal your words that you say are spoken from your heart. And I know that you struggle with the changes to your heart Our Lord is doing in you. AS you were speaking those words of love, and happiness for me, I heard Our Lord speak to me, to Pay Attention--That the TEST was for YOU! And I did as Our Lord Spoke for me 2do. I Am very sorry that you are struggling in the way you are with the changes Our Lord wants you to make. I Will always be your friend, even more now. Please know this truth from my heart and soul...No matter how long it takes you to grow and mature, to learn what you do not know from Our Lord, if you ever do.....Please Never forget this, I Do Have So Much Love for you! You have Always been one that I considered a friend. And, I Want you to know that When that Divine Opportunity Is Revealed by the Lord, I Will take it And I will welcome you back with the biggest hug and with the abundant out pouring of Tears of Pure Joy! I understand that you are fighting against the Work of the Lord concerning your heart and what He wants to Change and Grow and Mature within you, so that YOUR Character will Continue to be balanced and to sustain Your Gifts, Anointing and Talent Given to you by Our Lord. Just know, that I have Covered you with Forgiveness, Peace, Joy and UnconditionaLove in the name of our Lord, Jesus., And that I do LOVE you very much and always will My Friend! Phil 2:13 "[Not in your own strength] for it is God Who is all the while effectually at work in you [energizing and creating in you the power and desire], both to will and to work for His good pleasure and satisfaction and delight." Hate Has No Place In The House Of God !